The ubication is very good near of all touristic places and in a zone were there are a lot of offices. Located a 1 block of the metro, very easy to move for the city. Approppriate services for a comfortable stay. An Alarm went off two nights in a row. Once at 1130pm and the 2nd night at 2am. You could also smell smoke from the room above and the internet was slow. Staff were helpful and any query or service were addressed immediately. Hotel was very nice and spacious with all the facilities for stay. The overall experience was good and safe, the WiFi reception was not good inside the room. 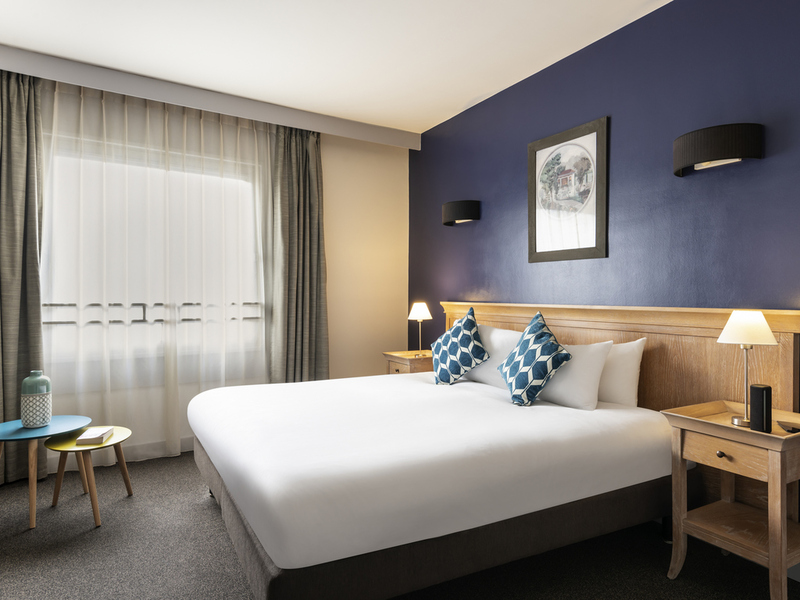 The hotel is usefully positioned near the metro and the Défense shopping centre. However there were few other useful or good characteristics. The actual entrance is difficult to access and poorly signposted, the area is rather shabby and certain parts of the hotel mirrored thus, the room was too warm, the thermostat did not seem to make much difference. Breakfast was ok but not memorable, although the service was good. As a result value for money is not evident. The walls between rooms are too thin : we can easily heard the tv of the neighbor or the discussions they have. The carpets in the corridor are worn out and stained The water hose of the shower is not enough strong, too light But I have appreciated that shower gel and shampoo were at disposal. And the breakfast was good. The apartment is meant to be a suitable home base for a business traveller staying over several days. My impression was that whoever designs and arranges the interiors does not give this much thought: First of all, the lighting. I expect a good reading light at the bedside (yes: there are still people alive who read books, not screens!) and on the table. The lamp on the table was wobbly in its hinges and I could not move it for fear of breaking the support. Second, this being Paris, and Paris being in a climate zone where much of the time a coat is required, I wonder why there is no coat hook in the vestibule. I cannot hang a wet coat inside the wardrobe. Third, the shaving/cosmetics mirror in the bathroom. There was one, but it was wedged behind the larger mirror frame in such a way that it could not be moved. Using it required contortions. These are basic features and one wonders at the thoughtlessness of whoever designs and fits out the apartments. Then there was a problem with the bathroom itself: It took more than five minutes of running it for the shower to provide warm (not hot!) water. Also, there was a very foul smell of sewer emerging from the shower plug hole. Improvement for more Stars !! Rooms and location are very good undoubtedly ! You need to take something measures against only following points to get More stars. > Reception always takes time, seems Not professional. Sometimes he/she prioritizes catching phone calls over Customer. > Not smart Entrance. 1st floor entrance is always closed on Sunday ( even though many customer will be checking in). We have only intercom on Grand floor. But Sometimes no connection. > Taxi arrangement is not good. > The shower doesn't come out very well. > Room is cold. Heater is weak. I use to stay at this same hotel since 2011 and the quality decreased dramatically! Its good but we need to improve on cleanliness of the rooms more and they should be renovated. I have always (stayed multiple times in Adagio) this complain about the reception staff, whatever I request they will write it down in a piece of paper but never fulfill. We have to do lot of follow ups. I wrote &quot;we&quot; because the same complaint from other colleagues who stayed. Please start a new process which will help solve issues faster. Some bad incidents this time stay, 1) Had requested for bath shower gel in the reception on Sunday Morning 9th December. I had gone out and came in evening at about 6pm and asked why the gel is not refilled. The reception staff was never knowing about the he said he cannot help until Monday 9am, that too I have to come down and request. I said, I have to go to office tomorrow morning but he never cared. I told to find out a way, to this he says buy a Bath soap from outside. Is this the service expected from Adagio hotels???? That was Sunday evening and there was no carrefour open too nearby. This is really bad service and bad response/behaviour from the reception staff. 2) I had washed some clothes on 7th December Friday evening 7.45p. The charge written was 5 EUR / 12kg. I just washed clothes which was less than 12kg. I had put 20 EUR, but the machine just returned 5 EUR. I complained to reception staff but he directed to complain the office near washing machine next day morning. I did the same,, for that the response was that the washing machine is not owned by Adagio and mail will be sent to the concerned company. I never got my 5 EUR back till by departure on 11th December. This is really slow and pathetic service. Adagio could not return me 5 EUR to the customer who has paid approx. 4000 EUR for the complete stay. 3) Lastly, all our request is over heard. I told the reception staff at departure that I want a taxi which can accept American express card. The taxi which came did not had that facility which made things difficult for me while paying back to the taxi. Too bad! I like your apartment but these things definately need improvement. I hope this feedback is going to the right person who can take steps to improve the service before my next visit with you. So eventhough I was happy to stay with you, my overall experience was low because of above things. It was very nice and quiet to stay thare. Front door was closed and nobody to answer for at least 5mn... Taints (old chewing-gum?) on the carpet, small rooms (especially regarding the price paid ! ), very tiny shower cabin with shower hanging not holding... expensive breakfast... won't stay here again : better walk 5-10mn more and get a more enjoyable place. The staff is not welcoming. Room too cold and bad smell. The staff was not welcoming. It missed the number of the room 3 times. The sink was broken and tried to fix it, unsuccessfully. The room was too cold and I was sick for this. The smell in the hotel was very bad. They didn't change the towels and make the bad. I do not recommend this structure!! !